Quotient integrates seamlessly with Xero. You can lookup your Xero Contacts and Xero Inventory Items when creating Quotes. These are real-time lookups, meaning they work seamlessly alongside Quotient’s own powerful Contacts and Template Items. Best of all, once a Quote has been Accepted, an Invoice can be created automatically in Xero. Click on your Account Name (on the top-right of your Dashboard), then go to Settings > Add-ons > Show More Add-ons… and choose Xero. Login to your Xero Account, select which organization you’d like Quotient to access and hit Authorise. You’ll be redirected back to Quotient. manually by hitting the 'Send to Xero' button. Confirm when Accepted Quotes are sent to Xero, what's included on the Invoices and the Invoice Due Date, hit 'Save'. Match your Xero Account Codes and Tax Rates to those which are in Quotient using the appropriate drop-downs, hit ‘Save’. Displayed on the Invoice is the Quote Title, Customer order/reference number, a permanent link back to your Quote for easy future reference and all Accepted Price Items, including Unit Price, Quantity and Heading. There's also the option to include the Long Description text on the Invoice. For an Item Code to appear on the Draft Invoice the Item Code must also be present in Xero AND Lookups for Xero Inventory Items must be enabled in Quotient. You can set the Invoice Due Date to be a specified number of days following the Quote Acceptance Date, or leave this empty and let the default Due Date in Xero or on the Xero Contact determine the Invoice Due Date. Contacts are sent to Xero when an Invoice is created. If a Contact already exists in Xero, Quotient will NOT replace or update the Contact or relevant Contact information. Contacts are matched by Contact name. Note: Make sure the currencies you quote in are also enabled in your Xero Account. When adding Contacts to Quotes you can include your Xero Contacts in Lookup Results. Xero Contacts are indicated with a Xero logo. 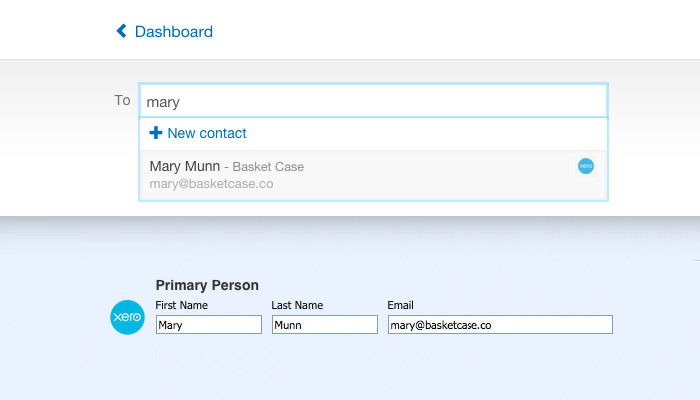 Once you select a Xero Contact it will be saved (copied) into Quotient Contacts. Note that only a person's name, email and company name are saved. Under 'Lookup Contacts' hit ‘Enable’. Your Xero Contacts will now appear in the Lookup Results. When adding Price Items to Quotes you can include Xero Inventory Items in Lookup Results. Xero items are indicated with a Xero logo. Under 'Lookup Inventory Items' hit ‘Enable’. Your Xero Inventory Items will now appear in the Lookup Results. Quotient does not create or update Xero Inventory Items. See the field matches for Xero/Quotient Items. If your Lookup Results data isn't appearing in Quotient exactly the same as your Inventory Items data in Xero, then you may need to refresh your Lookup Data. To do this, under 'Lookup Inventory Items' hit the ‘Disable’ button, confirm, then follow the steps to re-enable. A fresh cache of your Xero data will be created for the Lookups. Why would I need to do this? You'd only need to do this if you've deleted Inventory Items in Xero then recreated them (manually or with a CSV upload) and used an Item Code(s) that existed previously. You can start a new Quotient Quote directly from a Xero Contact by setting up a handy time-saving link, which will appear on your Xero Contact. By doing this it can save you time by jumping you straight into a new Quotient Quote with relevant Contacts details populated.